Late last night we secured a 25 case parcel of Pape Clements 2012, which we are focusing on this morning. Parker says in his tasting notes that ‘The iconic 2012 Pape Clement is a candidate for near-perfection as well as one of the wines of the vintage.’ His re-score makes it instantly undervalued and prices will adjust as the market corrects itself – it has already risen above £600 a case in Bordeaux. The table below represents all Pape Clement vintages since the 2000 which has been awarded 95 points or more. The lower scoring 2009 already trades at £775, while the 98 scoring 2005 is priced at £1,075 and the 96 scoring 2000 trades at £1,080. 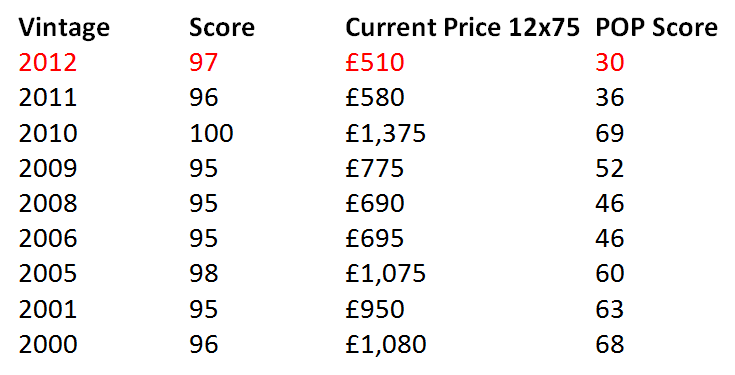 In fact apart from the 2011, there are no 95 scoring, or above, wines trading under £690 per case of 12 bottles. Pape Clement 2012 released at £550 ex-London, as such yesterday’s price is the lowest it has been. Now bottled, it is the cheapest physical vintage of Pape Clement since 2000 and their third greatest ever vintage. We have chosen to offer Pape Clement this morning at yesterday’s price, despite the price already moving past £600 a case. At £42.50 this 97 point Pape Clement is a no-brainer. First come first served!